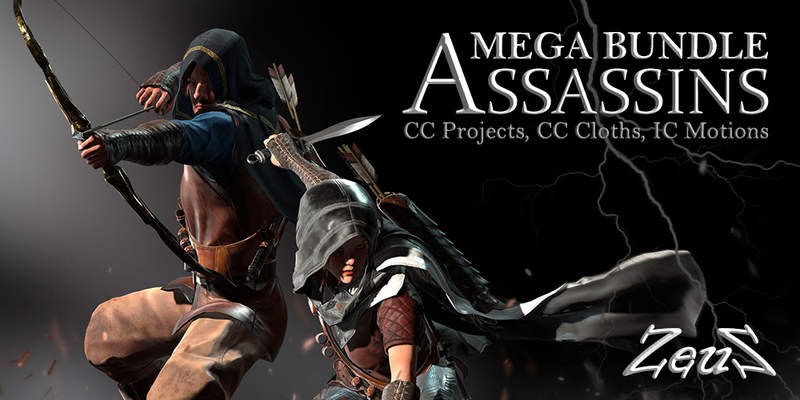 Description: This Assassins Mega Bundle delivers awesome dressing combinations, offering an easy way for you to define your own dark heroes made for PBR render engines like iClone 7, Unreal, and Unity. These great production assets are perfect if you are a game designer, or a 3D animation team as you will not only receive the 3D character models, but also the 3D bases for clothing and accessory customization. By using the Substance-enabled Appearance Editor in Character Creator 2.0 you can import your own custom texture maps, access powerful dynamic material editing features, and create thousands of modified PBR looks for your assassin clothes and equipments. Additionally, this pack includes four styles of coats, along with 12 assassin and civilian projects as a BONUS and collection of unique assassin motions like: dodging, sneaking, crouching, scouting, tightrope walking, evasion, detection, jumping, attacking, dagger attack combo, archery shot, and a set of roll stunt motions. Description: To better understand how iClone can be used in different types of movies, Reallusion has collected 5 major iClone previz tutorials from professional CG artists, TV producers, and directors. You can see how they can be used in different film genres such as Drama, Horror, Fantasy, Romance, and Sci-fi. Utilize iClone's universal character facial and body animation features with your own 3D character creation from Maya, Max or other tools. 3DXChange 5 allows you to fully export facial and body animation, along with all the baked motion constraints, spring dynamic, and accessory animation in a single MotionPlus file to any 3D CG tools or game engine as you wish. 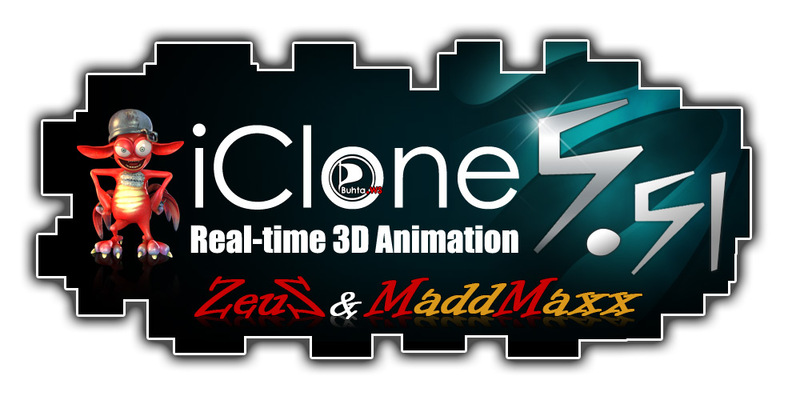 iClone 5 is real-time 3D animation with quick design & production tools for digital actors, environments, visual effects & in-house motion capturing. Use the power of drag & drop editing with access to the largest library of real-time ready 3D content, and a powerful physics engine for smooth subject interactions. Be amazed with this fully-featured 3D animation studio that has revolutionized the art of 3D animation. 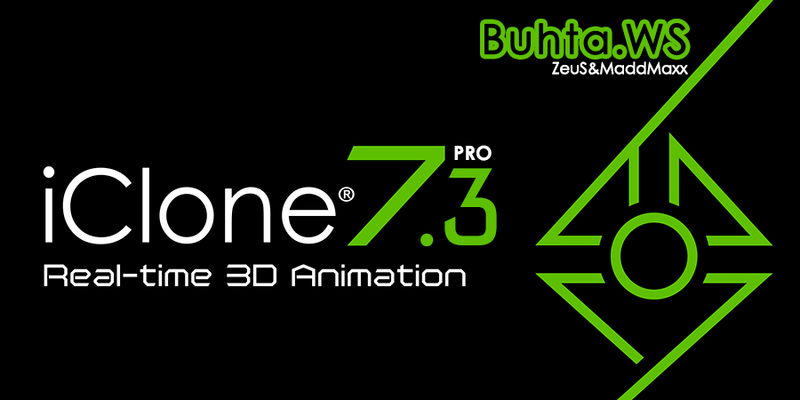 With iClone Version 5.51, your character animation pipeline is finally complete! The New MotionPlus format allows you to easily save all of your facial, body, accessory, spring and constraint data all into a single MotionPlus file so that it can be reused and reapplied to other characters. In addition, you're now able to customize your own landscapes with the height map terrain, directly in iClone! The Mocap Device Plug-in is the must-have tool that turns iClone5 into a complete mocap studio solution. With this Kinect motion capture tool, now you can use your own body to control virtual actors, in real-time, with motion smoothing optimizations. Lightspeed your animations and create authentic-looking motions without having to rent a mocap studio or even wear a markered jump suit!